Download the official Sony Xperia Z1 C6903 Stock Firmware (Flash File) for your Sony Smartphone. We also provide all other Sony Stock Firmware for free. Good day for Xperia Z1 owners. 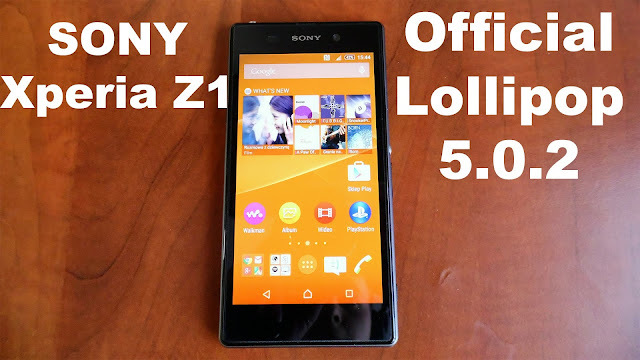 Sony just started rolling out the awaited Android 5.1.1 Lollipop update for the Xperia Z1. The update is currently reaching out the C6902 and C6903 variants of this device. Sony already made the major changes to the OS of this device by pushing Android 5.0.2 Lollipop update. The new update in the first place takes the version number to Android 5.1.1 Lollipop, which happens to be the latest and greatest version of Android. There are some core enhancements which improve the stability and performance of the device. The new update provides a full fix to the wide-spread stagefright vulnerability. It also integrates LinkedIn with your Calendar and Contacts Camera focus, speed and accuracy improvements in Superior Auto Mode have been made. There are quite many changes and enhancements that you may come across upon installing this update. At the time of writing this post, this update is rolling out to a few regions through OTA or through Sony PC Companion. If you haven’t been lucky enough to get this update yet, it may take a few days for Sony to cook this update and roll out for your region. If you happen to be an Android freak like me, you may want to skip the wait and update your device right away and that is what we are here for. Step 1: Download and install Sony Xperia USB driver on your computer. if you have already set up the USB driver in your pc then, skip this step. Step 2: Download and install Sony mobile Flasher on your pc. if you have already downloaded and installed the Sony mobile Flasher, then skip this step. Step 3: After Installed Sony Mobile Flasher, Open It. Step 4: You will able to see the dialog box. Select Flashmode and Click on OK. Step 5: Now, Select the Load button and Load the Sony Xperia Firmware (ftf file). Step 6: Now, Press and Hold Volume Down button and Connect the device to the computer using the USB cable. Step 7: Once, your Device is connected to the pc, then you’ll be able to see added message in Sony mobile Flasher tool. Step 8: Now, Flashing will begin automatically and can takes five-10 mins to finish. Step 9: Once Flashing process is completed, disconnect your Phone from the pc and turn it ON.